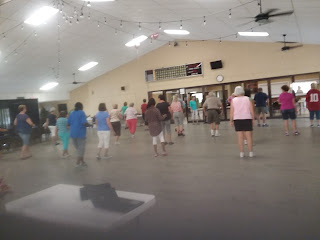 I got up in time to get ready, made us both some eggs and went to Line Dance class. I walked up, today my shoulder was hurting for some reason. We had so much fun. They started out with such a large group, and it winds down to just a few of us. Love it. Walked home had lunch a salad and yogurt I think. I had found a book up there. I wanted to read some books on my kindle. But Amazon will not let me download any. I even called the number that comes up, a few weeks ago and was on the phone for probably an hour to no avail. I was so frustrated. Still not able to download any. and go up to the center. They were having a Fantasy RV Tour information night that I wanted to go see, So I left and went up there.